The great Johnny Moss has some company in the World Series of Poker record books. 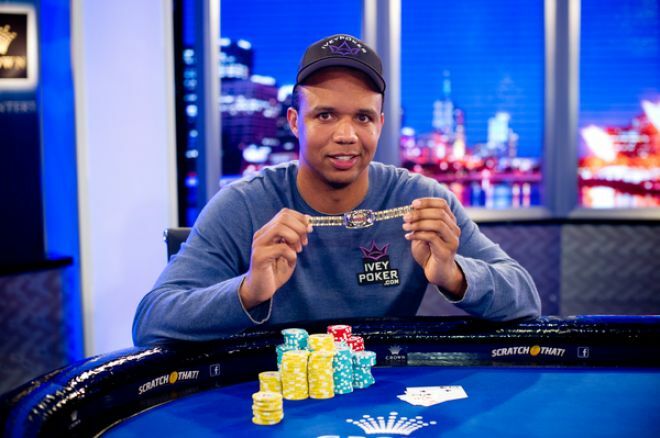 On Wednesday, Phil Ivey tied Moss for fourth all-time by winning his ninth WSOP bracelet at the inaugural World Series of Poker Asia Pacific at Crown Casino in Melbourne, Australia. Ivey defeated Brandon Wong in a grueling heads-up match to win the $2,200 Mixed Event for a top prize worth AUD$51,840 — a number which likely has little meaning to one of poker's all-time earners. Ivey's entire focus during the three-day event was the ninth gold bracelet that eluded him five times during last summer's World Series of Poker in Las Vegas. Ivey now sits tied for fourth behind Phil Hellmuth (13 bracelets), Doyle Brunson (10) and Johnny Chan (10) for the most prestigious mark in tournament poker. All nine of his bracelets have come in non-hold'em games, further demonstrating his dominance across all variants of poker. Ivey began the day with the chip lead and his good friend Daniel Negreanu was close behind, but it was Wong who started quickly out of the gate. He vaulted near the top of the leaderboard with the elimination of WSOP bracelet winner Kevin Song during the first pot-limit Omaha round of the day. With the blinds at 800/1,600, Graeme Putt min-raised to 3,200 and he got three callers in Negreanu, Wong and Song. On the flop, Wong checked and Song led out for 11,000 Putt and Negreanu folded, but Wong fired back with a pot-sized raise to 45,800. Song contemplated his next move for more than a minute before deciding to call. The fell on the turn and Wong moved all in. Song called and discovered that he was in bad shape. Wong made a straight on the turn and was out in front of the two pair of Song. The on the river brought an end to Song's tournament, and he exited in sixth place for AUD$8,978. Wong continued to amass chip early on by sending Rob Campbell to the rail in fifth place. During seven-card stud hi/lo, Campbell committed his last 1,100 chips showing the and Putt, Ivey and Wong came along. Wong bet out 3,000 on fourth and only Ivey called, and Ivey then bet 6,000 on fifth showing . Wong called with the up. Ivey and Wong both checked on sixth, and they did the same on seventh. Wong flipped over , which was good enough to beat Ivey and Campbell. Campbell was sent to the rail in fifth place for AUD$12,020, and only four players remained. 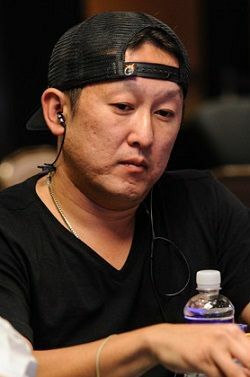 Negreanu entered the final table in good shape to win his fifth WSOP bracelet, but his run ended in fourth place, and again it was Wong who handled the dirty work. Playing pot-limit Omaha, Negreanu raised to 4,500, and Wong put in a three-bet worth 14,500. Action folded back to Negreanu and he called to see a flop of . Action continued to apply pressure by betting 18,500 and Negreanu called. The turn was the and Wong bet enough to put Negreanu all-on. "Kid Poker" called quickly, and the cards went on their backs. Wong was in the lead with top two pair, but Negreanu had straight and flush draws. With his tournament life hanging in the balance, the fell on the river to send Negreanu out in fourth place for $16,336. Negreanu hasn't won a WSOP bracelet since 2008, but he'll have one last shot in Australia when the Main Event kicks off on Thursday. Wong's assault raged on when he knocked out Graeme Putt in third place. During the seven-card stud round, Ivey brought it in with the , Wong completed showing the and Putt raised with the up. Only Wong called, and he proceeded to call Putt's on fourth, fifth and sixth streets, with Putt committing the rest of his stack on sixth. Wong called revealed a wheel , leaving Putt drawing dead. Putt, who also made the final table of Event #1 here in Melbourne, collected $22,427 for his third place finish. That left Wong and Ivey playing heads-up with poker history on the line. The two players exchanged the chip lead numerous times over the next few hours without committing their entire stack. Wong took a nearly four-to-one lead into Level 21, but Ivey won a big pot during the 2-7 triple draw round to cut the lead in half. Two hands later Ivey reclaimed the lead by winning a massive no-limit hold'em hand. With the blinds at 2,000/4,000, Wong raised to 10,500 on the button and Ivey re-popped it to 31,000. Brandon Wong called and the two players saw a flop of . Ivey maintained the lead by betting 40,000 and Wong called, bringing the on the turn. Ivey moved all-in for around 105,000, sending Wong into the tank for several minutes. Eventually, Wong laid down his hand, and Ivey regained the lead by a slim margin. Ivey extended his lead over the next several rounds before final Wong doubled up during the no-limit hold'em round. Wong was all-in with and Ivey called with . The flop brought a pair of nines for Wong, and his pair held up through the turn and river to give him close to 200,000 in chips. He then picked up a big pot on the next hand, pushing him back in front. But Ivey battled back, eventually grinding Wong down to a few big bets before securing the title during the 2-7 triple draw lowball round. Ivey dominated the triple draw round all day, so it was only fitting that he closed the tournament playing that variant. That concludes our coverage of Event #3 here at the WSOP Asia Pacific at Crown Casino. Stay tuned to PokerNews.com for tournament reports, interviews and feature stories from the 2013 WSOP APAC from Melbourne, Australia!